We are please to announce that Vashon CannaCulture will be hosting a harvest celebration for the entire Vashon Island cannabis community on December 7th from 3pm until 7pm at the old VFW hall. This is a private party for Vashon Island residents only. 21 and over only. This time of year we are grateful for the bounty that summer grow season offers and the promise of year round indoor growing too. 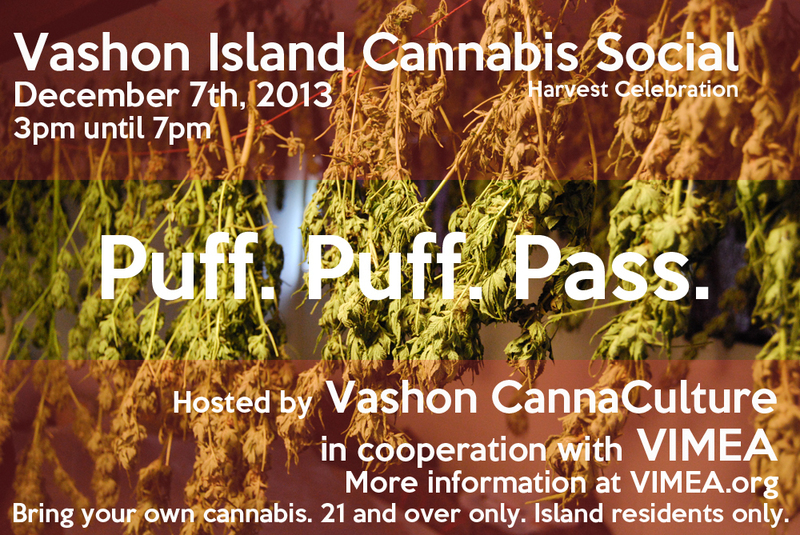 Master Joshu from Vashon CannaCulture is bringing together growers and other lovers of cannabis for a social mixer to share stories and Puff Puff Pass. Because of how the laws are presently, please bring your own cannabis. Master Joshu has a variety of excellent attractions taking place including a vape bar, door prizes and such. More on that as he fills us in. Come on out and celebrate our island's most successful cash crop, a powerful medicine and a very good time! Posted on November 9, 2013 by Shango Los and filed under Events.